رضائی, موسی, فلاحی, فرزاد. (1394). اعمال مدل تحلیلی برای سفتی درگیری در مطالعه ارتعاشات غیرخطی سیستم‌های چرخ‌دنده‌ای. نشریه پژوهشی مهندسی مکانیک ایران, 17(3), 6-26. موسی رضائی; فرزاد فلاحی. "اعمال مدل تحلیلی برای سفتی درگیری در مطالعه ارتعاشات غیرخطی سیستم‌های چرخ‌دنده‌ای". نشریه پژوهشی مهندسی مکانیک ایران, 17, 3, 1394, 6-26. رضائی, موسی, فلاحی, فرزاد. (1394). 'اعمال مدل تحلیلی برای سفتی درگیری در مطالعه ارتعاشات غیرخطی سیستم‌های چرخ‌دنده‌ای', نشریه پژوهشی مهندسی مکانیک ایران, 17(3), pp. 6-26. رضائی, موسی, فلاحی, فرزاد. اعمال مدل تحلیلی برای سفتی درگیری در مطالعه ارتعاشات غیرخطی سیستم‌های چرخ‌دنده‌ای. نشریه پژوهشی مهندسی مکانیک ایران, 1394; 17(3): 6-26. مدل­سازی ارتعاشی سیستم­های چرخ­دنده­ای برای مدت طولانی بر اساس تئوری ارتعاشات خطی انجام می­گرفته است ولی در دهه­های اخیر اهمیت منظور کردن عوامل غیرخطی مانند لقی و اصطکاک و عوامل متغیر با زمان مانند خطای انتقال و سفتی متغیر با زمان دندانه­ها و سایر عوامل بیش از پیش مشخص شده است. هدف از انجام این تحقیق، بررسی ارتعاشات غیرخطی یک جفت چرخ­دنده ساده درگیر در حضور لقی و خطای انتقال استاتیکی می­باشد. بدین منظور ابتدا سفتی درگیری متغیر با زمان دندانه­ها به صورت تحلیلی محاسبه شده است. سپس معادلات حاکم بر سیستم با در نظر گرفتن عوامل مذکور استخراج و با استفاده از روش رانگ-کوتا حل شده و تاثیر پارامترهای سیستم بر ارتعاشات غیرخطی آن بررسی شده است. Ozguven, H. N., and Houser, D. R.,” Mathematical Models used in Gear Dynamics – A Review”, Journal of Sound and Vibration, Vol. 121, No. 3, pp. 383–411, (1988). Wang, J., Li, R., and Peng, X., “Survey of Nonlinear Vibration of Gear Transmission Systems”, Applied Mechanics Reviews, Vol. 56, No. 3, pp. 309–329, (2003). Kahranam, A., and Al-shyyab, A., “Nonlinear Dynamic Analysis of a Multi-mesh Gear Train using Multi-term Harmonic Balance Method: Period-one Motions”, Journal of Sound and Vibration, Vol. 284, pp. 151–172, (2005). Kahranam, A., and Al-shyyab, A., “Nonlinear Dynamic Analysis of a Multi-mesh Gear Train using Multi-term Harmonic Balance Method: Sub-harmonic Motions”, Journal of Sound and Vibration, Vol. 279, pp. 417–451, (2005). Shen, Y., Yang, S., and Liu, X., “Nonlinear Dynamic of a Spur Gear Pair with Time-varying Stiffness and Backlash Based on Incremental Harmonic Balance Method”, Journal of Mechanical Sciences, Vol. 416, pp. 1256–1263, (2006). Parker, R. G., Virjayaker, S. M., and Imajo, T., “Nonlinear Dynamic Response of a Spur Gear Pair: Modeling and Experimental Comparisons”, Journal of Sound and Vibration, Vol. 237, No. 3, pp. 435–455, (2000). Chang-Jian, C., and Chang, Sh., “Bifurcation and Chaos Analysis of Spur Gear Pair with and without Nonlinear Suspension”, Nonlinear Anlysis: Real World Application, Vol. 12, pp. 979-989, (2011). Lukzko, J., “Chaotic Vibration in Gear Mesh Systems”, Journal of Theoretical and Applied Mechanic, Vol. 46, No. 4, pp. 879–896, (2008). Wan, C., and Jian, C., “Nonlinear Analysis for Gear Pair System Supported by Long Journal Bearings under Nonlinear Suspension”, Mechanism and Machine Theory, Vol. 45, pp. 569–583, (2010). Walha, L., Fakhfakh, T., and Haddar, M., “Nonlinear Dynamic of a Two-stage Gear System with Mesh Stiffness Fluctuation, Bearing Flexibility and Backlash”, Mechanism and Machine Theory, Vol. 44, pp. 1058–1069, (2009). Bonori, G., and Pellicano, F., “Non-smooth Dynamics of Spur Gears with Manufacturing Errors, Journal of Sound and Vibration”, Vol. 306, pp. 271–283, (2007). Kaung, J., H., and Lin, A. D., “Theoretical Aspects of Torque Responses in Spur Gearing Due to Mesh Stiffness Variation”, Mechanical Systems and Signal Processing, Vol. 17, No. 2, pp. 255-271, (2003). Liu, G., “Nonlinear Dynamics of Multi-mesh Gear Systems, Presented in Partial Fulfillment of the Requirements of the Degree Doctor of Philosophy in the Graduate School of the Ohio State University”, the Ohio State University, (2007). Howard, I., Jia, S., and Wang, J., “The Dynamic Modeling of Spur Gear in Mesh Including Friction and a Crack”, Mechanical Systems and Signal Processing, Vol. 15, No. 5, pp. 831-853, (2001). Davoli, P., Gorla, C., and Boni, G., “Transmission Error and Noise Emission of Spur Gear: A Theoretical and Experimental Approach”, Proceeding of the ASME 2007 International Design Engineering Conference, IDET/CIE2007 September 4–7, Las Vegas, Nevada, USA.DETC2007–34099, (2007). 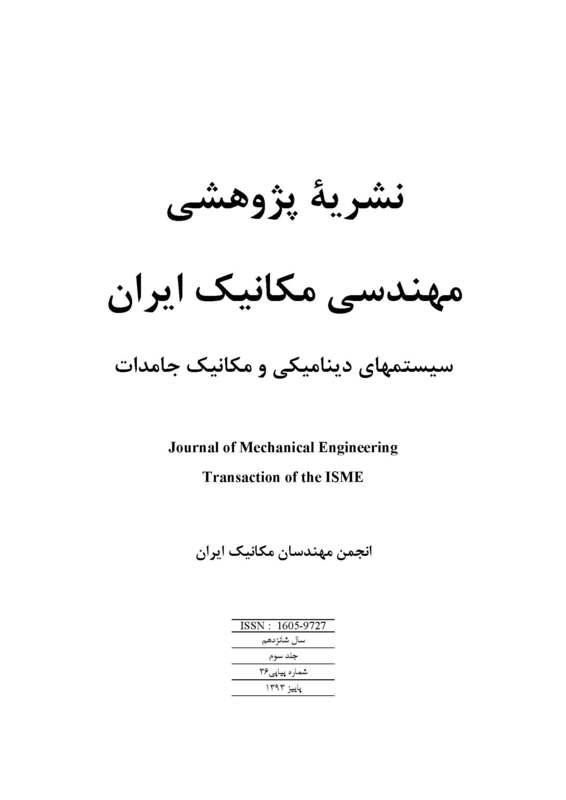 Farshidianfar, A., and Saghafi, A., “Global Bifurcation and Chaos Analysis in Nonlinear Vibration of Spur Gear Systems”, An International Journal of Nonlinear Dynamics and Chaos in Engineering Systems, Vol. 75, No. 4, pp. 783-806, (2014). Li, S., and Kahraman, A., “A Tribo-dynamic Model of a Spur Gear Pair”, Journal of Sound and Vibration, Vol. 332, pp. 4963–4978, (2013). Modification and Tooth Root Crack”, Mechanism and Machine Theory, Vol. 62, pp. 63-74, (2013). Chaari, F., Fakhfakh, T., and Haddar, M., “Analytical Modeling of Spur Gear Tooth Crack and Influence on Gear Mesh Stiffness”, European Journal of Mechanics A/Solids, Vol. 216, pp. 461-468, (2009). Sainsot, P., and Velex, P., “Contribution of Gear Body to Tooth Deflections–A New Bidimensional Analytical Formula”, Journal of Mechanical Design, Vol. 126, pp. 748-752, (2004). Yang, D. C. H., and Sun, Z. S., “A Rotary Model for Spur Gear Dynamic”, ASME Journal of Mechanism Transmission and Automation in Design, Vol. 107, pp. 529-535, (1985). Weber, C., “The Deflection of Loaded Gears and the Effects on their Load Carrying Capacity, Dept. of Scientific and Industrial Research”, Sponsored Research, Germany, Report No. 3, (1949). Shen, Y., Yang, S., and Liu, X., “Nonlinear Dynamic of a Spur Gear Pair with Time-varying Stiffness and Backlash Based on Incremental Harmonic Balance Method”, Journal of Mechanical Sciences, Vol. 48, pp. 1256–1263, (2006).